This story has been in the news- Here it is and I am wondering what you may think about it…. 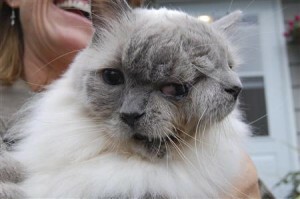 (Reuters) – Frank and Louie, a gray feline with two mouths, two noses and three eyes, just turned 12 years old and is the world’s oldest, living two-faced cat. Sara Wilcox, a Guinness World Records spokeswoman said he is the “longest surviving Janus cat,” referring to the name coined by British zoologist Dr. Karl Shuker, based on the two-faced Roman god of transitions, gates and doorways. Frank and Louie has craniofacial duplication, an extremely rare congenital condition. The disorder, also known as diprosopia, can cause part or all of an individual’s face to be duplicated on its head. Frank and Louie was born on September 8, 1999. His remarkable life will be commemorated in Guinness World Records’ new 2012 edition, Wilcox said. The cat’s owner, a woman only identified as Marty, lives near Worcester, Massachusetts. She was a veterinary technician in 1999 when a day-old, two-faced kitten about the size of her thumb was brought into her clinic to be euthanized. “When he was first born, every day was a blessing,” Marty told a local radio station on Tuesday. She immediately adopted Frank and Louie. The cat has one brain so both faces act in unison. Two of his eyes — the outermost ones — are normal, while the middle eye is larger but doesn’t function. The cat eats on the right side, using Frank’s face, which is connected to his esophagus, while Louie’s nose twitches at the same time, his owner said. He is absolutely beautiful, thank God for Marty to allow this wonderful cat to live and experience life. I think it’s wonderful that Marty was willing to take in Frank and Louie. Apparently, he has been able to lead a happy life. Wonderful story about a special cat and a very special person. Shows there are miracles and more people should use more consideration and thought before being so quick to euthanize. Where there is life, there is always hope; provided the animal is not suffering. This is such a wonderful story. Marty is an angel for seeing Frank and Louie as a gift and not a burden. Our world needs more people like this who can look past the imperfections (and isn’t it a world that stresses the greatness of perfection?) and see the goodness inside. Blessings to Marty and Frank and Louie! Very unusual cat living with a very special person. All live should be given a chance, this one got a beautiful one and lived it. This is great, but please don’t forget about the original owner of the kitten, who chose NOT to drown, let die naturally, or chuck him away. That humane decision allowed Marty to save him. 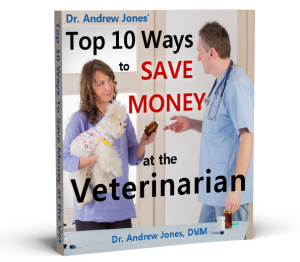 With the cost of vet services, which so easily could have been avoided, this ci worth remembering. Frank-n-Louis sure looks like a beautiful cat! Stories like this one (Marty/Frank/Louie) are good for the heart and soul. God Bless Marty for being the kind, caring individual that she is. God sends us the people we need when we need them. This applies to both humans and animals alike. Much like humans that are not born normal do one kill it? One cannot just kill/uthenize any living creature just because of these symptoms. God blessed us well and in abundance with all beautiful loving creatures and things all around us for us to take care of them, each other and His earth – we can learn a lot from our furry friends. They all teach us a thing or two in their own silent ways. I would have done the same as Mary – may God continue to Bless us all and have mercy on us. Glory be to God! Thanks for sharing this amazing story . . . . I think that this woman who owns Frank and Louie shows the kind of love, dedication and kindness that we need more of for all of our animals on this wonderous earth. The spirit of this baby kitten spoke to Marty and she listened. Oh I love them both, or should I say all three. The cat is so adorable, he really is. Why wouldn’t anyone want to adopt him. And, he has sometime extra special. He has two noses for you to kiss with love and two mouths for him to love you back. Now, that is a true gift from God above, and Marty is the one true angel sent from God to give unconditional love. You go Lady Love! Stories like this make my day and give me such joy. Makes you wonder if we can all see the beauty in this cat and the uniqueness of it, then why can we not see it in humans? Wonderful story. Now here’s a “purfect” God-filled person who gave this animal a life. I only wish more people would give life to “human babies” instead of aborting them. A lesson to be taught/learned here. Great story, thanks for sharing it!! I saw this cat on TV. This is a wonderful story. Goes to show you that it’s God Who decides who lives and who dies, even a two faced cat! Way to go Marty!!!!!! What an amazing story of love and devotion!! This world is sorely lacking in people like Marty, thank God for people like her who will give the ‘undercat” a chance at a happy, love-filled life. God Bless Marty, Frank and Louie. They are truly a beautiful kitty, and prayers for a long and happy life. I just wanted to add, as someone else mentioned, it was truly an act of kindness on the part of the original owner to bring the baby into the vet’s for euthanization. He or she could have easily taken the cheaper and more brutal way out but didn’t. Kuddos to whomever, your act of kindness was rewarded with a long and happy life for this little gift who in all odds would never have survived. Fate caused you and Marty and Frank ‘n Louie to cross paths, there was a reason that you chose that path that day. God Bless you too. Yikes! He must scare the pants off trick or treaters! Lol. It is amazing. I’m glad somebody gave the under dag a chance. You don’t see that very often. Bless the original owner, Marty, and Frank’n’Louie!what a beautiful story , an inspiration to us all. I believe that God creates “imperfections” in animals and people to allow us to show compassion and love .Thank you for sharing ! I am owned by a dog born with “defects” – he’s been a wonderful pal and I wouldn’t have him any other way. He’s a walking, playing, loving miracle, but not one of his defects hurts him or slows him down much – BOOO to those who would have destroyed him at birth, as being “more merciful”! If I had the opportunity to take care of such a special cat, I would in a heart beat! Special Need’s animals are truly a blessing! I think that story is wonderful, thank God there are people out there like Marty. I think a lot of people think because the kitten looks different it shouldn’t live. All animals should be given a chance. On one side we end lives that weren’t meant to be ended and on the other hand we prolong lives that were meant to end. Doesn’t really make much sense to me. Way to go Marty! May you be blessed for taking in Frank’n’Louie. When I see Frank and Louie, I think of the phrase, 2 heads are better than one, literally.!!!!! They are adorable and incredible.!!! May they live many more years.!!!! God bless Frank and Louie and Marty.!!!!!!! What has “god” got to do with it? Evolution is a fact and god is a creation of the mind that is why there are so many gods. A great lady for taking him and loving him, and also taking him out for walks. While on his walk I’m sure a drunk somewhere will give up the drink. I am not sure why this cat has two names…with one brain and each side in unison, he would have one personality. but he looks cool! More cat to love! This article made my day:) It shows there are beautiful people still left in this world, and I’m sure the cats are very loved. what a beautiful little creature. I am so comforted to know there are people like this woman who are kind enough to give him a chance to just be a kitty:) I’m sure he doesn’t know he is any different. What do you all think about this comment? Nancy Gambrell Gomez commented on your link. MARTY……….THANK YOU FOR GIVING HIM A CONTINUE CHANCE FOR LIFE YOU HAVE A LOVING HEART OF GOLD..WE NEED MORE PEOPLE LIKE YOU……….IT IS AMAZING WITH OUT YOU LOVE AND SUPOORT,,HE MAY NOT HAVE MADE IT…THANK YOU AND GOD BLESS YOU AND MAY YOUR BEAUTIFUL COMPANION LIVE FOR MANY YEARS NOW. Well, here I am again and my comment that took me 15 minutes to write up about God and this beautiful cat has disappeared from this page! I added another memo and then it was gone! Do not know what happened! It was about all of our creatures coming to Heaven with us and how God loves us all and came down to earth as a sacrifice to save us all from a fallen world. I love God and all of His creatures; however, I stay far away from the ones who could swallow me whole even though I would love to hold and kiss them all! In Heaven I can for sure! Read John 3:16 in the Bible and come to Heaven with me if you have not already made that decision. I pray to see you all there with all of your precious animals as well! God Bless you all! I love how so many of us love God’s precious creatures!